Shadow & Blade: A Guide to Assassins in Tunnels & Trolls is out now, so I wanted to share a little excerpt from the book - namely the new character type Assassin of The Fist. You can pay what you want and download the book from DriveThruRPG. Descendants of the great Kawanaka, assassins of The Fist are experts in martial arts and remaining unseen. They haunt the night, slipping through windows and wrapping a garotting wire around their target, or dispatching of them with a blow dart tipped with venom. The assassin of The Fist is an adept martial artist. 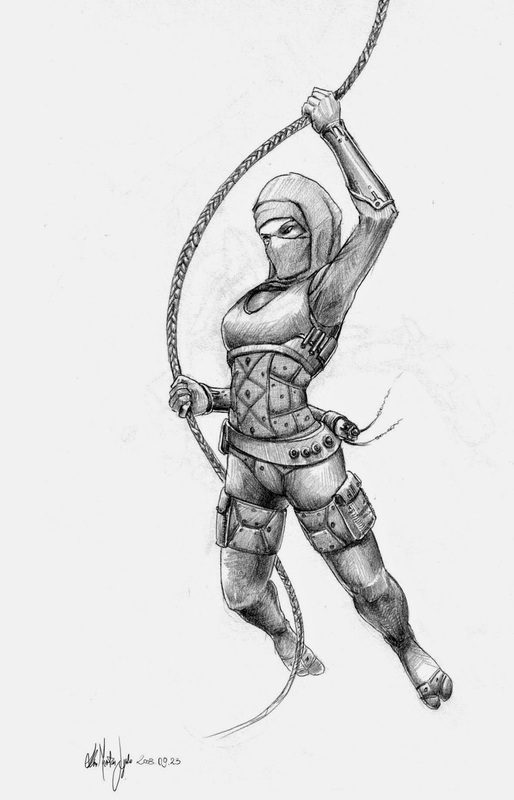 When in hand-to-hand combat without a weapon, the assassin rolls 3 dice to attack. However, they may not use any weapon aside from unusual weapons with 2 dice or under, any dagger or ranged weapons with 2 dice or under. The Fist assassin is excellent at stealth, meaning she always rolls a level under the saving roll she is required to make for her Stealth talent. So a level 3 saving roll becomes a level 2 saving roll. Assassins cannot afford to be weighed down by armour, so can only wear full suits of quilted silk/cotton and soft leather armour. They may also not wear helms, as they can constrict vision and they may only wear a leather jerkin on the torso. They may not use shields. They may, however, wear any leg or torso armour. When an assassin is in the dark they are considered to be invisible, reducing enemy combat totals against the assassin by 50%.